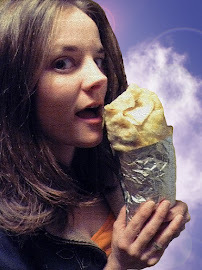 Back in May, I sought salvation from burrito mediocrity with help from my friend, Jesus. I was left with a bad taste in my mouth and overwhelming emptiness. Today, well... I decided to follow my soul in a different direction. 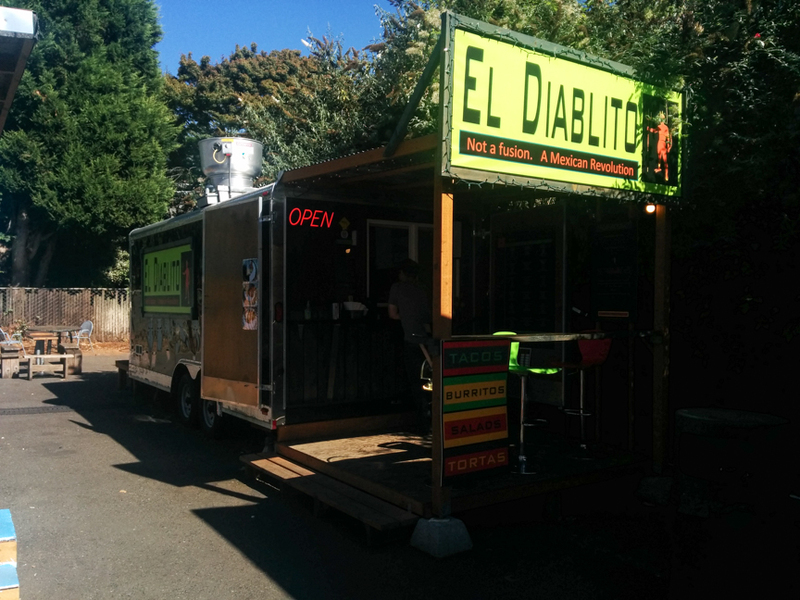 El Diablito is located on SE Belmont Street between 33rd and 34th in a tiny food cart pod. I was skeptical at first, because the cart itself had such an appealing aesthetic, which can mean overpriced gringo food. It was just too sterile, and with the slogan: "Not a fusion. A Mexican Revolution" I became even more concerned. But Hell, I was hungry and there were good smells around. Sides: I asked for the habanero and green crema salsas. Sometimes, it takes days for me to muster up a halfhearted review... but not this time. In fact, I just finished this guy and I couldn't wait to post about it! I haven't been so excited about a review in a really long time. I'm melting right now just by reliving that first moment, when this little devil whispered into my ear and I gave in and embarked down into the fiery abyss of burrito bliss. Upon first taste, I was met with the most heavenly mouthful of succulent pork I've had in a really long time. Tender, juicy, exquisitely spiced... Transcending time and space and pleasure and pain. That pork, holy crap... that pork! It's suppleness and heat was perfectly balanced by the crisp, cool lettuce (just a tiny bit) and fresh avocado. After a couple of bites, another layer of flavor began to effervesce through the porky chipotle, and I realized it was the potato stick fries. Flowing up and down one side of this guy, these crunchy little potato explosions were simply delightful. To die for! They were like super crispy hashbrown morsels, infused with extreme potato flavor. EXTREME! The refried beans were tough to come by, but the ones I did find were scrumptious. The strange thing about this guy was that for all of that pork love, there was no grease. How does that happen? Amazing! So many layers of intertwined flavors happening here, it was like being spun through a web of everything and nothingness all at once. Like becoming completely lost -yet found- beyond the confines of physicality. I need to take the rest of the day to let this one simmer and swoon and sink back down onto planet Earth. Thank you little devil, for this grand adventure! Thank you for sharing your quest! NEVER GIVE UP!!! I hope you'll be able to hold out as long as possible under the new regime. 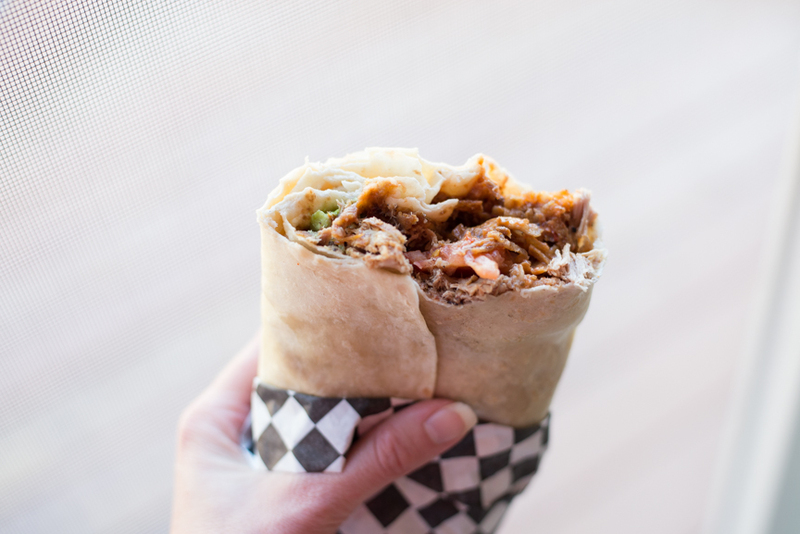 Whither the burrito in 2017? Now more than ever do we need its comfort. 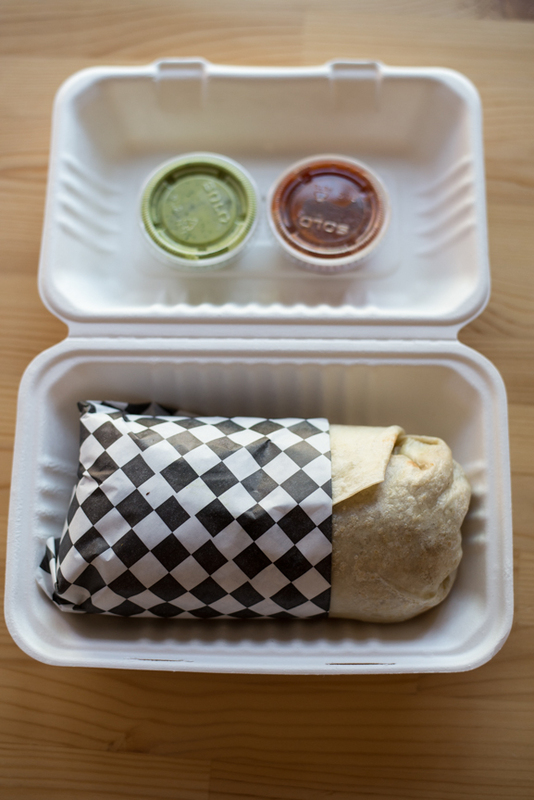 Indeed more burritos to follow soon?